Any Porteño (a resident of Buenos Aires) will tell you that the city is divided into plenty of different neighborhoods. The artsy San Telmo for example, feels very different to the leafy avenues of Palermo, and both are completely different from the touristy lanes of La Boca. Regardless of of the differences, they will all agree Recoleta is probably one of the more desirable area. Although traveling around the city is easy, where you choose to stay will determine your overall experience of it. For those who like to travel in style, there is only one choice, Recoleta. It is probably the most upmarket of the central neighborhoods and it is home to designer shops, world class restaurants, and the famous cemetery where Eva Peron is buried. 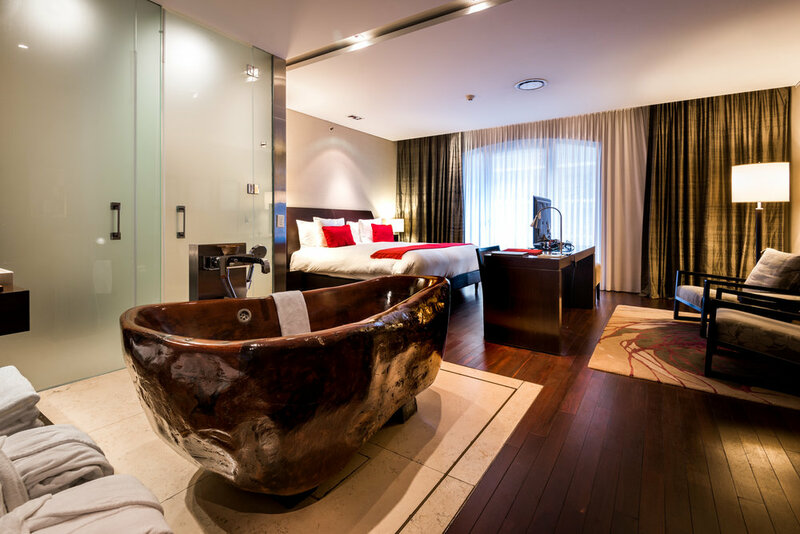 It is also where the Hotel Mio is located, a luxury boutique hotel with a focus on art and design. Buenos Aires is a city of historic elegance and Hotel Mio reflects this while at the same time adding its own modern twist. Our weakness for boutique hotels, as well as its location in the heart of the city, meant that this seemed like the perfect place to stay. We had come to Buenos Aires because of its reputation as a city not to be missed. While it is unmistakably South American, it keeps one foot in Europe and at times could almost be mistaken for Spain or Italy. It is a refined place and its inhabitants have a taste for the finer things in life. This comes out in their architecture, music, food, and in the mannerisms of its people. These are its main attractions and visitors come to taste the wine, eat the meat and to experience its cultural expressions such as tango, and to walk its beautiful streets. Thanks to their strange, dysfunctional economics and politics, another bonus is that the city is also relatively cheap – there are few places in the world where you can live in this much style at such a low cost. Mio Hotel makes an impression right from the beginning. The front door is six meters high and constructed from French wine barrels. Inside the lobby is sleek with a tasteful combination of exposed concrete, glass, wood, metal, and textiles being used in its design. The rooms are equally elegant with wooden floors, metal fixtures, and frosted glass doors coming together nicely. It is the work of the talented designer Delfina Ross, who incredibly is only twenty-five years old. With a little input from other local artists, she created a hotel that fulfilled her artistic vision as well as meeting the needs of the customers, and Christina Catena – the owner. Christina believes that alongside providing comfort, the hotel should generate surprise in its guests. As she says on the website, within the design you can find “something new, something old, something dreamed, something perfect. That’s Mio Buenos Aires.” Her passion for creativity does not stop at interior design, and she is also an art fan. Throughout the building you will find the work of emerging local artists providing both beautiful decoration for the hotel, and exposure for its creators. One of the most striking design elements can be found in the rooms. Each one is home to a unique bath unlike any that we had seen before. They are carved and engraved by hand by Argentinian artist Mario Dasso from trees harvested on the Pampas. The result is a graceful yet functional work of art, finished with smooth metal taps and taking pride of place in the centre of the room. As well as being a way to show them off, their location is part of the wider design choice to make the rooms as open as possible. The toilet is the only thing hidden behind a door, and this creates a feeling of space and modernity. We stayed in one of the deluxe rooms and were pleased with our choice. A nice feature is the office space; the uncluttered nature of the room makes it an easy place to get some work done. Aside from the usual amenities (a bar, tv, wifi etc. ), the hotel is also home to a spa. Simply named ‘8th Spa’ due to its location on the 8th floor, it is an oasis of tranquillity in the heart of the busy city. Once again the design excels with black stone walling, matching flagstones, and floor to ceiling windows putting you in a relaxed mood before you have even begun using the facilities. These include a giant jacuzzi, a fitness centre, and a Miha Bodytec machine. I indulged in a half hour massage and it was the perfect way to unwind after a busy day of exploring. Another nice touch is that you can use the spa after you have checked out, perfect for if you have time to kill before onward travel. As you have probably gathered by now, design is the key feature in every element of the Mio hotel. This philosophy extends even to the restaurant. It takes its name - Sivela 465 – from the Finnish verb ‘to paint’ and Christina Torres, the Spanish chef, sees herself as an artist painting her plates with colorful flavors and smells. Needless to say, the dishes all looked great when they arrived. One of the best things on the menu is the salmon served with charred endives, green beans, cherry tomatoes, capers, and black lime butter. Also deserving a mention were the maize dumplings with black pudding gremolata, and the camembert au gratin. The breakfast buffet was also good with a selection of fruits, charcuterie meats and cheeses, and Argentinian pastries. Everything you need to start a bust day well. After our breakfasts, we spent our days exploring the city, starting with the Recoleta neighborhood where we were based. It is a great place to walk around with the atmosphere of the city streets being an attraction in themselves. Nearby you can find art galleries and museums, as well as many fine churches and parks. If you have some money to spend there are plenty of upmarket shops in the area, and lots of restaurants and bars. Of course you can’t stay in Recoleta without visiting the cemetery, a maze of elaborate tombs and mausoleums put up to honor the city’s richest residents. Recoleta is also well connected, and it only takes a short taxi ride (or trip on the nearby metro) to reach the other parts of the city. Visit Centro to see the enormous 9th of July Avenue with its famous obelisk, and the parliament buildings of the Plaza de Mayo. San Telmo is the place to find the cool, young, arty crowd, and it is swimming with street art, grungy bars, and bustling flea markets. La Boca is a traditionally working class port area known for its colourful houses and for being the birthplace of tango, while Puerto Madero is a docklands area that is recently been done up making it a vibrant and new part of the city. Whether you are visiting for work or pleasure, it makes a great option and is a unique place to call home for a few days. Considering the great location and facilities as well, you could certainly do a lot worse than this.